BarryWoodham Brothers Scrapyard, Barry, South Wales. The source of many locomotives now in preservation. Scrapyard is the colloquial name for Woodham Brothers Ltd, formerly Woodham & Sons, of Thomson Street, BarryWoodham Brothers Scrapyard, Barry, South Wales. The source of many locomotives now in preservation., Wales. The scrapyard was responsible for saving more than 200 steam locomotives, including 13 now based at the SVRSevern Valley Railway. The business was founded in 1892 by Albert Woodham. After his retirement in 1947, the business was run by his youngest son Dai Woodham. It employed around 200 people and encompassed Transport, Marine and Metals as well as the scrap metals business for which it is best known. Under the Modernisation Plan for British Railways, announced in 1955, more than 500,000 redundant wagons were put out to tender for disposal by BRBritish Rail or British Railways. Woodham Brothers were one of the scrap dealers invited to take part, and began cutting up wagons in 1957. At the same time BRBritish Rail or British Railways were withdrawing locomotives faster than their own yards could dispose of them, leading to growing stockpiles of redundant locomotives at Works such as Swindon. Woodham Brothers and other scrap dealers approached BRBritish Rail or British Railways seeking to scrap these as well as the wagons, and by 1959 Woodhams would become involved in the scrapping of locomotives. 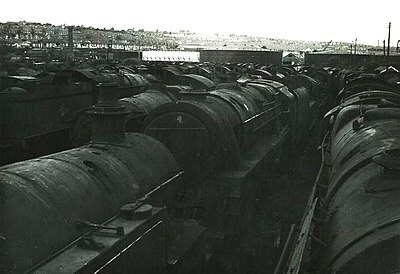 The first four locomotives arrived at BarryWoodham Brothers Scrapyard, Barry, South Wales. The source of many locomotives now in preservation. on 25 March 1959, numbers 5312, 5360, 5392 and 5397. Locomotives were acquired initially from Swindon and the Western Region and by 1964 from the Southern Region as well. Around 100 steam locomotives were eventually scrapped at BarryWoodham Brothers Scrapyard, Barry, South Wales. The source of many locomotives now in preservation. or re-sold for disposal elsewhere, of which around 40% were scrapped in the first three years. Thereafter the rate slowed and by 1965 Woodham Brothers decided to concentrate on the simpler process of disposing of wagons in order to generate funds to pay for the locomotives already purchased and acquire others. Post-1965, purchases of locomotives continued at a slower rate but also included a number from the London Midland Region. By the late 1960s, more than 200 locomotives had reached BarryWoodham Brothers Scrapyard, Barry, South Wales. The source of many locomotives now in preservation. and were attracting the interest of fledgling preservation groups such as the SVRSevern Valley Railway. The first locomotive to leave the yard was no 43924 in September 1968, destined for the Keighley and Worth Valley Railway. Acquisitions continued even as more locomotives were sold, although the greatest number of locomotives in the yard was thought to be around 221 in mid-1968. By the early 1980s around 150 locomotives has been ‘saved’ from BarryWoodham Brothers Scrapyard, Barry, South Wales. The source of many locomotives now in preservation., with groups such as the ‘BarryWoodham Brothers Scrapyard, Barry, South Wales. The source of many locomotives now in preservation. Steam Locomotive Action Group’ and ‘BarryWoodham Brothers Scrapyard, Barry, South Wales. The source of many locomotives now in preservation. Rescue’ being formed to help preserve those remaining. The last ten locomotives passed into the ownership of South Glamorgan County Council (and latterly the Vale of Glamorgan District Council) with the intention of establishing a Welsh Railway Museum. However further sales from the ‘BarryWoodham Brothers Scrapyard, Barry, South Wales. The source of many locomotives now in preservation. 10’ followed and now in 2016, only 2 ex-BarryWoodham Brothers Scrapyard, Barry, South Wales. The source of many locomotives now in preservation. locomotives remain at the site which is now the home of the BarryWoodham Brothers Scrapyard, Barry, South Wales. The source of many locomotives now in preservation. Tourist Railway. Of the 23 locomotives currently resident at the SVRSevern Valley Railway that were owned by BRBritish Rail or British Railways or the ‘Big 4’ companies, 13 were rescued from BarryWoodham Brothers Scrapyard, Barry, South Wales. The source of many locomotives now in preservation.. 6 others came direct from BRBritish Rail or British Railways (1450, 43106, 45110, 46443, 47383 and 48773), 3 from the NCBNational Coal Board (813, 1501 and 7714) and one from London Transport (5764). Arrived BarryWoodham Brothers Scrapyard, Barry, South Wales. The source of many locomotives now in preservation. Left BarryWoodham Brothers Scrapyard, Barry, South Wales. The source of many locomotives now in preservation. Of these locomotives, only 4150 has yet to steam in preservation. A number of former residents were also rescued from BarryWoodham Brothers Scrapyard, Barry, South Wales. The source of many locomotives now in preservation., of which 46521, 4141, and 78019 began their preserved life on the SVRSevern Valley Railway before moving elsewhere. 3612 was purchased from BarryWoodham Brothers Scrapyard, Barry, South Wales. The source of many locomotives now in preservation. in 1978 as a source of spare parts for the SVRSevern Valley Railway's other panniers, but the frame was later cut up after wheels, boiler and other components were re-used. SR 34053 Sir Keith Park was restored elsewhere but first ran on the SVRSevern Valley Railway. 6634 also spent a period at the SVRSevern Valley Railway but has yet to steam in preservation. The SVRSevern Valley Railway also acquired a quantity of track fixtures and fittings from BarryWoodham Brothers Scrapyard, Barry, South Wales. The source of many locomotives now in preservation. during visits in 1981, including chair keys, pandrol clips, fishplates and rail anchors. This page was last modified on 27 March 2018, at 14:34.